Fez (founded in 793 AD) is found in the foothills of the North Middle Atlas mountains of Morocco, North Africa. The medieval centre of Fez, the Medina (market) has not changed for centuries. Its narrow alleys house hundreds of merchants and craftsmen selling a range of products such as dates, fish, spices, copper urns, carpets and musical instruments. The narrow alleys are busy with local people and tourists brave enough to find their way through the maze. Walking through the centre is like going back centuries. 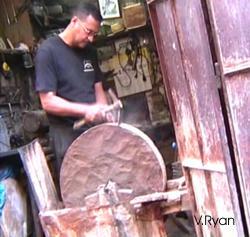 The photograph opposite shows a traditional craftsman ‘dressing’ a hand-powered grinding wheel. Fez was a place of considerable importance until recent times, being the depot for the caravan trade from the south and east of the African continent. It was also regarded as a seat of Arab learning, a Holy City and a place of pilgrimage - when the route to Mecca was obstructed. One of the most interesting sites in Fez is the Leather Souq and the oldest leather tannery in the world. The tannery dates back at least nine centuries. When approaching the tannery the smell is the first suggestion that something different is about to appear. The smell drifts around the balcony from where all the activity can be viewed and is enough to put off the most enthusiastic of tourists. The stench is worth braving as the view over the balcony allows those watching to see a site that has not changed since the 11th century. The tannery is composed of numerous stone vessels filled with a vast range of dyes and various odorous liquids. The tannery processes the hides (skins) of sheep and goats, turning them into high quality leather products such as bags, coats, shoes, slippers and other similar products. This is all achieved manually, without the need for modern machinery. Men work in unbearably hot conditions (in the summer - 40 degrees and above). The tannery is a good example of mass production, a process that we often consider as being modern. The workers stand in the stone vessels arranged like honeycombs, filled with different dyes, dying the arms and legs of the men. The hides are first soaked in diluted acidic pigeon excrement and then transferred to other vessels containing vegetable dyes such as henna, saffron and mint. When the dying process has been completed the hides are dried on the roofs of the Medina. The leather products sold in the Medina in Fez are manufactured on a nine centuries old production line. Many people consider the work of Henry Ford (the Model T - Ford Car) at the beginning of the twentieth century, as being the earliest example of a production line. This is not the case, both the Chinese and the Egyptians manufactured many products, especially weapons on production lines, thousands of years ago. The simple diagram below shows the manufacturing process in the Leather Souq. The production line created five hundred years ago is basically the same today. It is a flexible production line because large or small batches can be manufactured and also the product (both size, shape and colour) can be changed quickly. Many of the characteristics of a modern batch production line can be seen in production system in the Leather Tannery in Fez, Morocco. 1. Draw an outline of Africa and add the all the countries that make up this large continent. Pinpoint the City of Fez, in Morocco. 2. Draw a flowchart that clearly shows the stages of production in the Fez Tannery. Briefly explain each stage.